The Episcopal Church is the the American branch of the world wide Anglican Communion, a group of churches tracing their roots to the Church of England. The Church is made up of between two and three million worshipers in about 7500 congregations across the United States. The fundamental structure of the larger Episcopal Church is that of Dioceses lead by Bishops elected by the local membership. 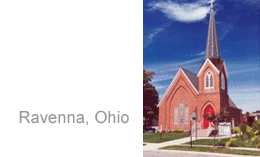 Grace Church is part of the Diocese of Ohio, covering the Northern half of Ohio. In 2004 The Rt. Rev. Mark Hollingsworth, Jr. was ordained and consecrated as the 11th Bishop of the Diocese of Ohio. You can find more information on the Episcopal Church at the national website and at the Diocese of Ohio site. Two main sources that briefly outline our beliefs are The Creeds (Apostles' Creed and Nicene Creed) and The Catechism, both found in the Book of Common Prayer. The rector (priest/pastor) is willing to meet with anyone who would like to explore and learn more about the Church. We WELCOME visitors, explorers, or those looking for a church home. Most Episcopalians would agree that worship, fellowship, and ministries and outreach, in which we take part (at Church and in the community) are a meaningful part of our lives.